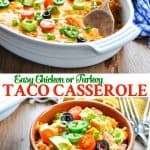 This Easy Taco Casserole recipe is the perfect way to use up leftover chicken, leftover turkey, or that rotisserie chicken that you picked up from the deli! 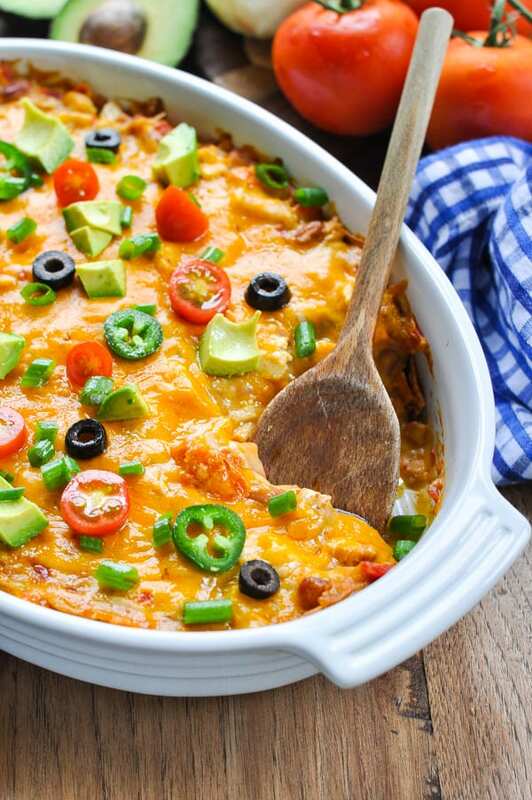 Layered with Doritos or tortilla chips, this simple make-ahead meal is a quick dinner that your family will devour! This layered taco casserole is kind of like a Mexican lasagna, comprised of crunchy Doritos, cheese, and taco meat — all baked in a creamy sauce. I like to prepare mine in advance (during nap time, of course) and then just pop it in the oven when we’re ready to eat. Garnish with some fresh toppings and your family will think you spent hours in the kitchen! 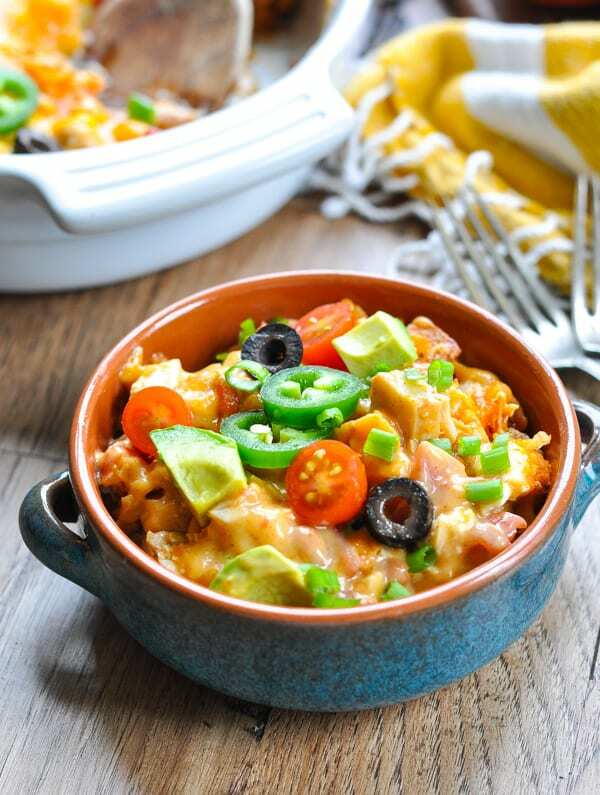 This Easy Chicken Taco Casserole comes together with just a few basic, family-friendly ingredients! First, let’s start with the filling. 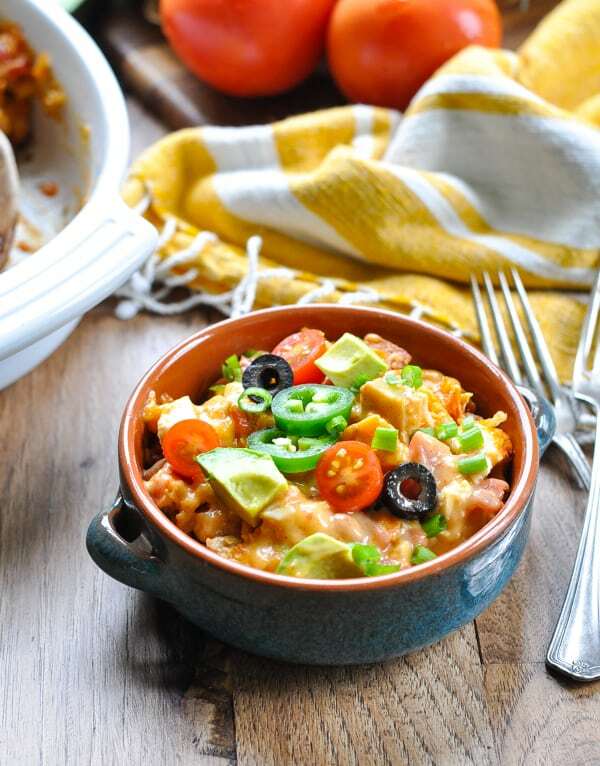 You’ll need diced (or shredded) cooked chicken or turkey, condensed cream of chicken and cheddar cheese soups, sour cream, diced tomatoes, beans and taco seasoning. Stir everything together in a bowl and you’ve got the base of your casserole — done! 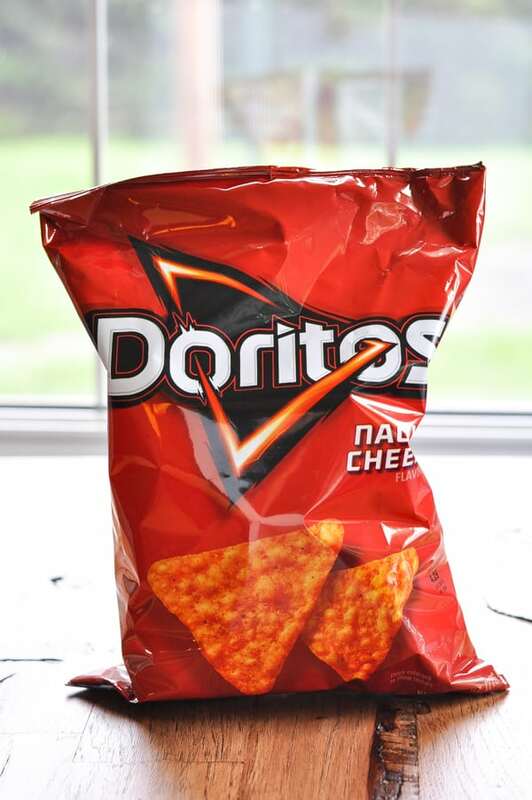 Next, the Doritos! My boys think that any meal involving Doritos is SUCH a treat! You can substitute with corn tortilla chips, if you prefer. 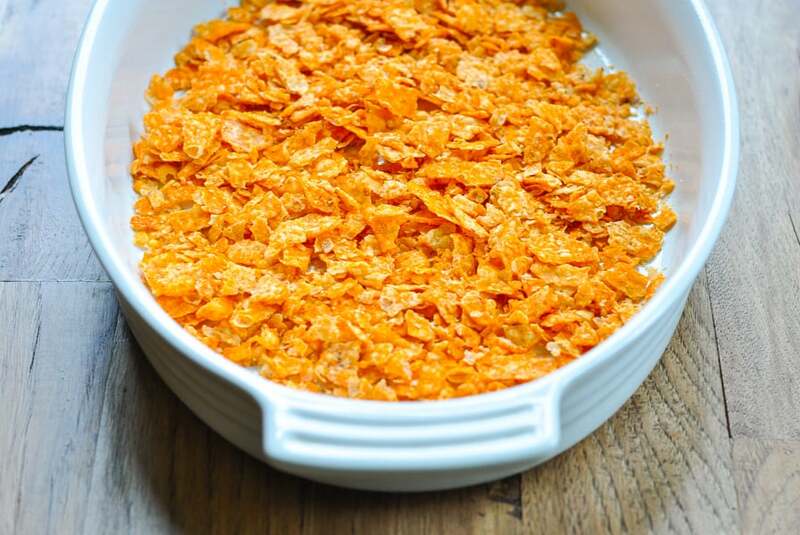 Spread half of the crushed Doritos in the bottom of a large baking dish that has been sprayed with cooking spray. Top with half of the meat mixture and sprinkle with about 1 cup of grated cheddar cheese. Repeat with another layer of crushed chips and the remaining chicken mixture. Cover the dish with foil and bake at 350 degrees F for 20 minutes. Then remove the cover, sprinkle with remaining cheese, and return to the oven to finish baking for about 10-15 more minutes. Since all of the ingredients in your casserole are already cooked, you’re really just heating everything through. You want the cheese melted and the filling hot and bubbly! It will require a total of about 30-35 minutes in the oven. 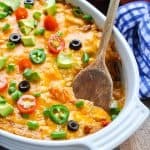 Can you freeze Taco Casserole? Yes! 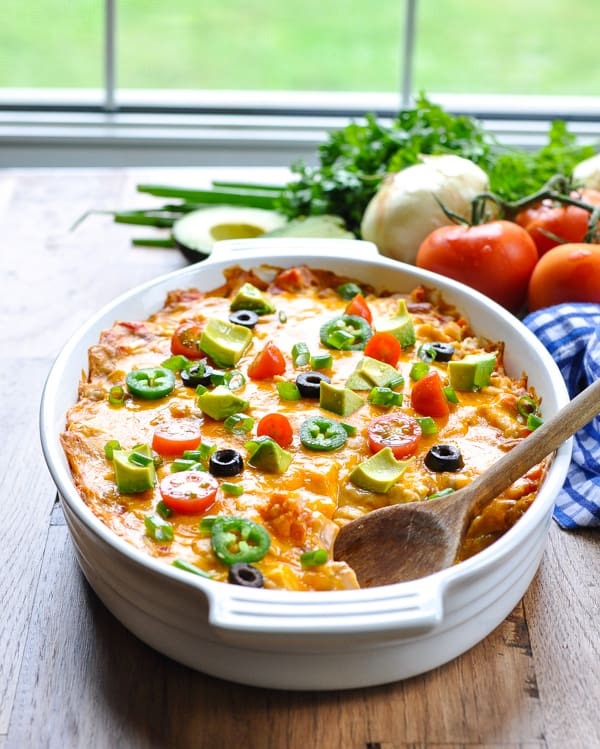 I suggest assembling the casserole as instructed (but add the final layer of cheese on top), wrap tightly with plastic wrap and foil, and freeze the dish BEFORE baking. 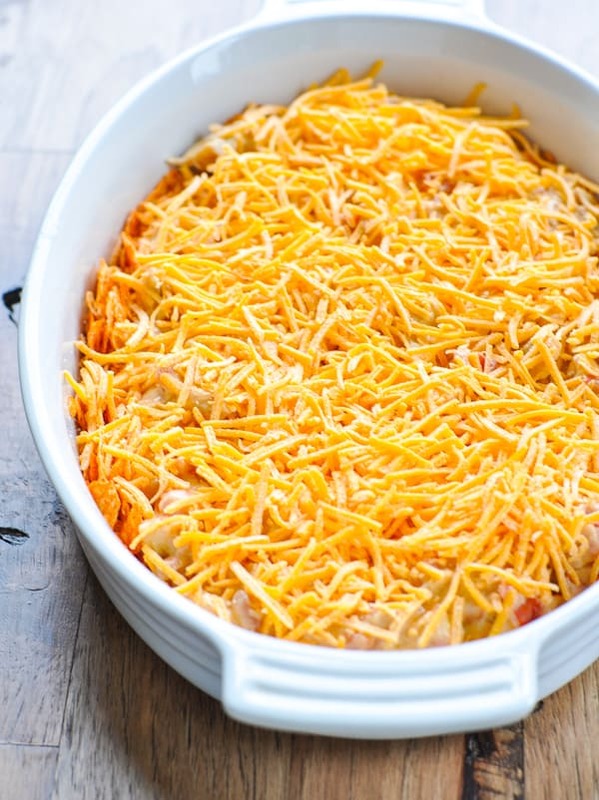 When ready to bake, thaw the casserole in the refrigerator overnight and bake according to recipe below. If you prefer to bake the dish directly from the freezer (while still frozen), leave the dish covered in a 350 degree oven for about 1 hour. Remove the foil, and then continue baking for an additional 15-20 minutes (or until the casserole is heated through). 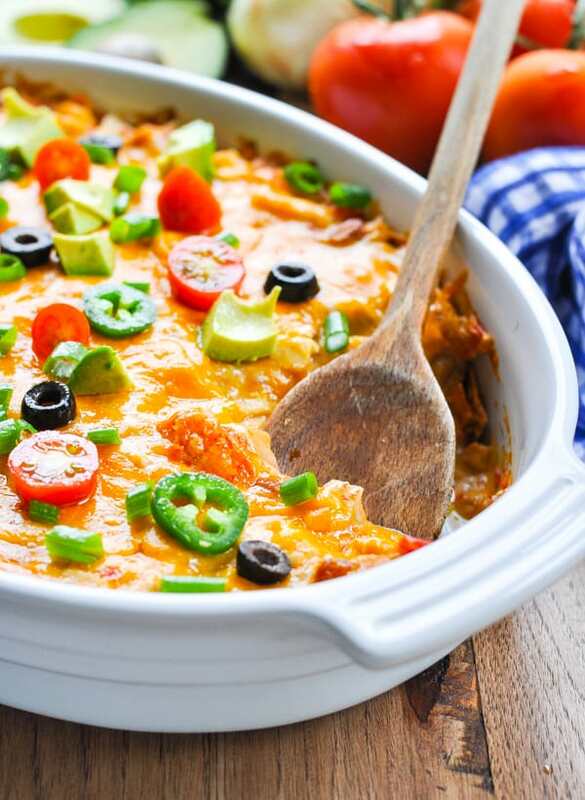 Cut the ingredients in half and bake the casserole in an 8-inch square dish. Alternatively, prepare the ENTIRE recipe, but divide the ingredients between two 8-inch square pans. Bake one now, and freeze the other for later! Preheat oven to 350 degrees F. Spray a 9x13-inch baking dish with cooking spray and set aside. 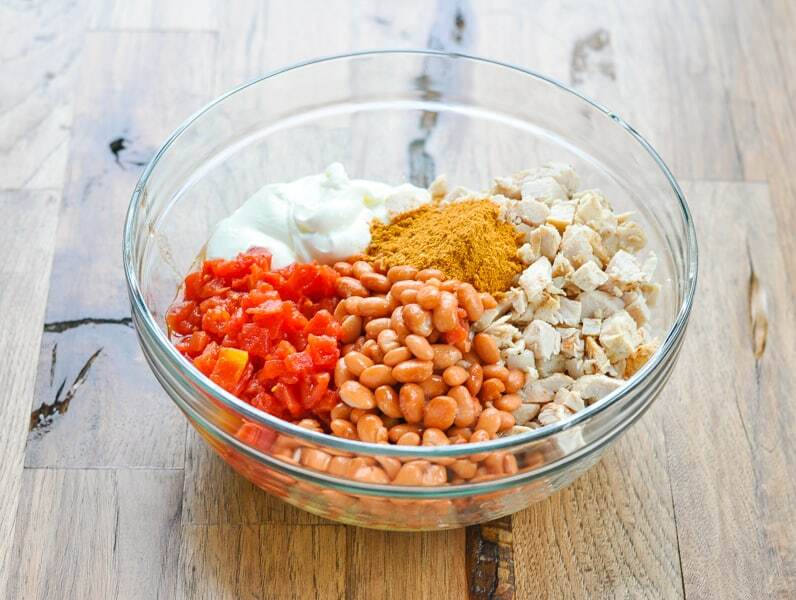 In a large bowl, combine chicken or turkey, soups, sour cream, tomatoes, beans, and taco seasoning. Place half of the crushed chips in the bottom of the prepared baking dish. Top with half of the chicken mixture. Sprinkle with 1 cup of cheddar cheese. Layer with remaining chips and finish with remaining chicken mixture. Cover and bake for about 20 minutes. Remove cover, top with remaining 1 cup of cheese, and bake for about 10-15 more minutes, or until cheese is melted and starting to brown on top. Cooking Just for Two? Cut the ingredients in half and bake the casserole in an 8-inch square dish. Alternatively, prepare the ENTIRE recipe, but divide the ingredients between two 8-inch square pans. Bake one now, and freeze the other for later! This post was originally published in November, 2013. It was updated in December, 2018.